Following the 2009 Black Saturday bushfires, survivors in the Yarra Valley hamlet of Steels Creek were tormented by three questions. What, precisely, happened that day? How on earth could they make sense of events? And how could a tiny community where 10 people and two-thirds of homes had been lost ever manage to heal and go forward? Tom Griffiths, director of the Australian National University (ANU)’s Centre for Environmental History, had friends in Steels Creek. He had also been studying Victoria’s mountain ash forests for two decades. … a research collaboration which … could help bush communities around Australia to understand fire better—and to survive it. And so was born a research collaboration which Professor Griffiths believes could help bush communities around Australia to understand fire better—and to survive it. The project spawned two books and a film, each addressing one of the three questions. Black Saturday at Steels Creek is a forensic account by Peter Stanley of the day’s events. Living with Fire, by Griffiths and an ANU colleague, Christine Hansen, is a history of the valley’s relationship with fire. And Afterburn, a documentary by Moira Fahy, follows three families trying to rebuild their lives. While all three works helped the community to “heal and come together and in some ways become stronger”, according to Griffiths, they also threw up wider lessons. The most important one, he says, was the need for “more fire studies that are local, ecological and historical”. Local because different forests produce different fires, meaning they require local knowledge, experience and management, rather than national or statewide strategies. 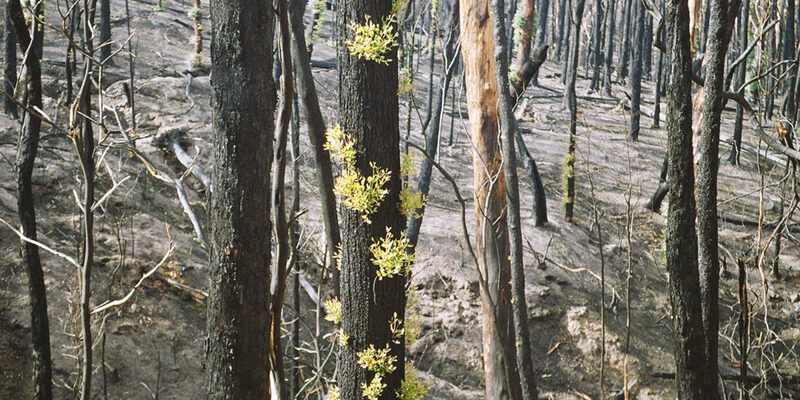 Ecological because fire behaviour is heavily influenced by vegetation, such as the highly combustible mountain ash forests north and east of Melbourne, which require rare but catastrophic fires to regenerate. And historical, says Griffiths, because “history is your best survival guide”. History teaches communities when the deadliest fire days occur. It teaches the distinctive pattern that bushfires follow, and whether they may escalate into what Griffiths calls a ‘firestorm’. The old-timers, he observes, “know from what direction the fire will come on a particular day and which parts of the valley will burn”. History also offers significant lessons for policymakers, such as the fact that the worst fires since British settlement have all occurred in the same region of Victoria. When such a firestorm looms, says Griffiths, encouraging people to believe they can safely defend their homes is mortally irresponsible. Another lesson: the bunkers dug by sawmill workers early last century—and gradually abandoned by subsequent generations—saved many lives. Communal memories may fade, but history and good storytelling keep alive such valuable insights. Griffiths notes that the cultural dimensions of fire—how we manage and cultivate it—are as crucial as the science, but receive little attention or funding. History also helped to illuminate the Blue Mountains bushfires of October 2013. While many believed they were unnaturally early, statistics show the region’s fire season has always peaked in November and December. In fact, October is “exactly the kind of incremental advancement you would expect” with global warming, says Griffiths. What disturbed him most about Black Saturday, by contrast, was its “haunting familiarity”, reinforcing his conviction that we need to act on the distilled wisdom of past experience.